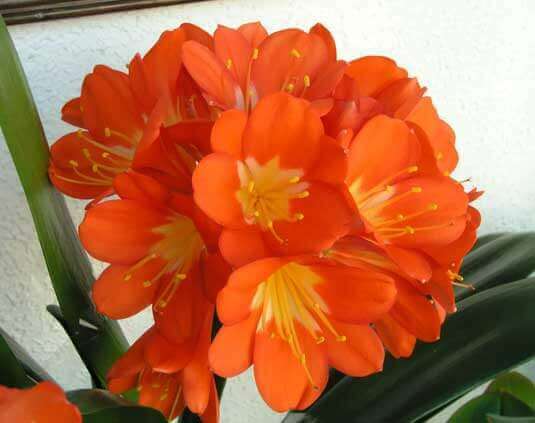 Clivia is a genus of monocot flowering plants native to southern Africa. They are from the family Amaryllidaceae, subfamily Amaryllidoideae. 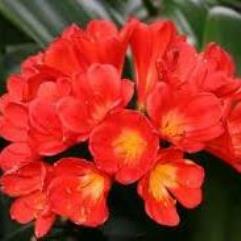 Common names include Kaffir lily and bush lily. They are herbaceous evergreen plants, with green, strap-like leaves. 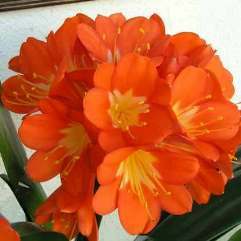 Flowers are bell-shaped flowers on a stalk above the foliage, and they are can be any color of orange, redish orange, bronze orange, peach, and greenish yellow. There are a number of variegated leaf patterns, including light of Buddha, and akebono. Leaves can be narrow or very broad. 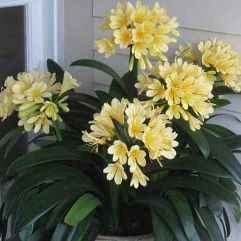 Of the six known species, Clivia miniata is the most widely cultivated. Specimens were gathered by British explorers William Burchell and John Bowie in 1815 and 1820, respectively. 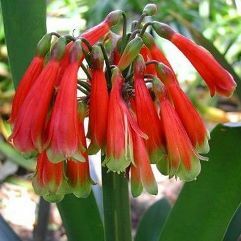 Clivia nobilis became the first named species when in 1828 the Kew botanist John Lindley named it in honor of Lady Charlotte Florentia Clive, Duchess of Northumberland (1787-1866 who was for a time the governess of the future Queen Victoria.